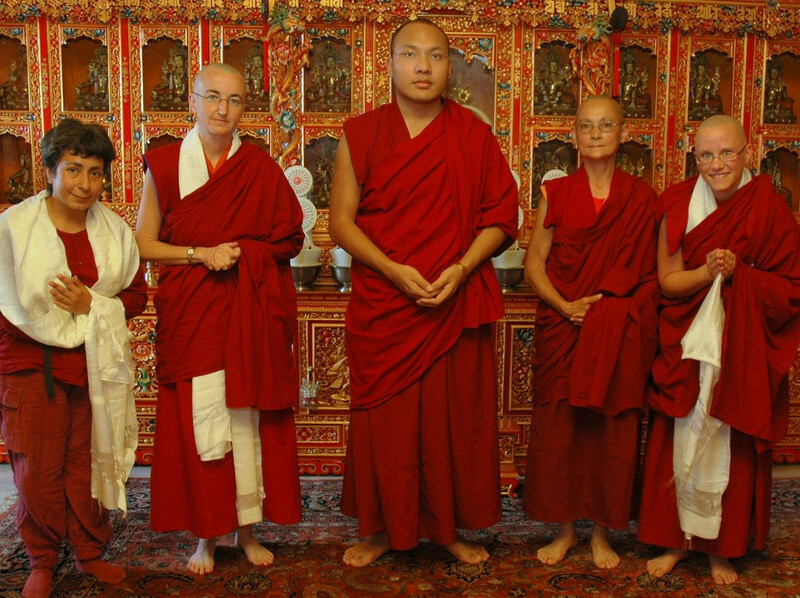 During an audience in early 2009 with His Holiness the 17th Karmapa, Ogyen Trinley Dorje, we presented our vision and broad aspirations. The following is adapted from what we expressed to His Holiness at that time. “We have begun living together, slowly trying out structures for community life that are both in accordance with the vinaya and suited to our backgrounds and Mahayana aspirations. We do this with the dream of building the foundations for a larger monastic community in the future. “For us as Westerners, this may take some experimenting, and we are committed to working together to find the right balance so that a strong, stable and harmonious community can slowly take shape. In the long term, we aspire to help create a community where nuns from many different countries can move towards enlightenment together. We wish to construct a beautiful and flourishing platform on which to benefit others in ways we ourselves cannot now even imagine. “As Westerners, we all grew up immersed in an environment that tells us that happiness depends on our acquisition of external goods and sense pleasures. Among the many teachings the Buddhadharma offers, the monastic path in particular provides direct and living proof that it is possible to be content with far less than our society would insist is indispensable for a happy life. Western monastics living meaningful lives joyfully can offer a powerful demonstration that the causes of happiness lie elsewhere than might commonly be thought. As such, we feel that Buddhist monasticism has a highly valuable contribution to make to Western culture, and thereby to the global culture that it influences. “Living together as monastics in community also offers a vivid demonstration of Buddha’s teaching that the pursuit of our individual happiness can only be successful when it actively takes into consideration the well-being of others. In this sense too, a harmonious monastic community can offer to Western society a direct argument against the belief that our own happiness can ever come at others’ expense. “Our purpose in living together is not simply to find supportive conditions for our individual Dharma practice and study. Rather, we take our community life as an integral part of our work to transform our minds, which is the aim of that Dharma practice and study. We value the chance to support each other in using community life as a means of recognizing and confronting our own afflictive emotions and self-cherishing and for generating tolerance and loving-kindness, and learning to cherish others. “However, individuals simply living in the same place do not constitute a thriving Dharma community. To build community, we find formal practice together important, for stability and a sense of closeness, and also listening to Dharma teachings together, for deepening our shared practice. On a practical level, we cook and eat together, follow a daily schedule that includes group prayers and practices in the morning and evening and listening together daily to recordings of Dharma teachings. “We see the guidelines that Buddha outlined for his monastic followers as personal instructions we can use to support the transformation of our minds, by disciplining our bodies and speech. We also see them as offering a blueprint for our community life. We find it highly beneficial to go regularly to the biweekly Sojong confession ceremony. We do not eat in the evening, and are sharing financial resources, so that when we handle money we can do so without the thought that it is mine. “Although we recognize that many of the rules in the vinaya were initially designed in response to a different context, still we want to try to follow this model wherever possible, and adjust only where it seems necessary to do so. For this, we see as crucial the guidance of a valid realized teacher – which we have already in Your Holiness – and a protected environment in which to apply the vinaya rules – which we are now creating with our community. “While it can be hard to confront our afflictive emotions, we feel ourselves to be unimaginably fortunate to live under the protection of our pratimoksha vows and to share this noble way of life. Our further good fortune at coming under Your Holiness’ care as nuns fills us with a joy that is impossible to express. This joyfulness helps us cultivate a relaxed mind, amidst the—sometimes difficult—work of self-transformation. We want to maintain this basic joyfulness as a cornerstone for our life together in community. “In some ways Western cultural backgrounds are not particularly conducive to communal life. Generally, we are raised to value our ‘independence,’ to have our own private space, and to plan and work for our own needs. As a result, after ordaining Western nuns often find it quite natural that they should live alone, look after their own material needs and practice the Dharma privately on their own. Since in any case there is a dire shortage of places where Western nuns can live and train together in community, the choice to develop a monastic style that is private and individual is easily taken. As a result, Westerners entering a monastic community will often have many adjustments to make, and the transition will not always be smooth. “Moreover, although we use the term ‘Westerners,’ in fact there is no single Western culture. Small as it is, our community already includes people from three very different cultures, and so our community life needs to take this cultural diversity into consideration as well. In any case, difficulties and conflicts inevitably arise to varying degrees in community life, where many egos and many sets of afflictive emotions are all gathered together. Only with time can we build up the needed confidence and trust in ourselves and each other to face such moments with equanimity and compassion. “For that reason, our thinking is not to take any new members until we have first built a stable base that others can then join, rather than adapting in response to the individual wishes of each new arrival to the community. At this point, we envision needing perhaps two years to slowly build the necessary foundation before we can begin thinking about growing beyond this tiny community now in its infancy. “Our aspiration is to work to make ourselves qualified to be of limitless benefit to others, without missing opportunities to offer our service to others in smaller ways along the way. We see the forming of a monastic community as an excellent way to do both, learning how to offer and offering at the same time. For now, our aim is simply to work to make ourselves and our tiny community suited to serve as a platform to benefit others in the future. His Holiness the Karmapa placed his palms together and said “yes” four times, looking directly at each of us in turn. Since this day, we have been extremely fortunate to have been able to receive his guidance in every step of our growth as a community.